Generational poverty occurs in families where at least two generations have been born into poverty. The JLA adopted this issue in 2013 due to its prevalence in our state. 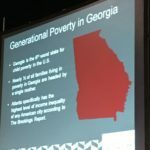 Georgia is the 6th worst state for child poverty, with more than one quarter of its children living in poverty. Many of Georgia’s children are struggling to have basic needs met. Growing up in poverty is one of the greatest threats to healthy child development; and poverty and financial stress can impede a child’s cognitive development and their ability to learn. The JLA is committed to eradicating generational poverty in the greater Atlanta area, and through efforts like LBDI, we as an organization are able to provide critical education on this issue and raise money to effect change. In 2013, nearly 575,000 of Georgia’s children lived in a food insecure household.